An appeal for the owner of a missing ring has sparked a plethora of puns on social media. 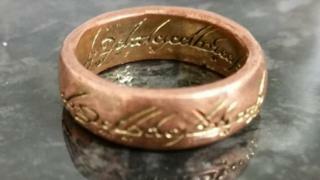 Gloucestershire police set out to find who owned the replica prop of the "One Ring" from The Lord of the Rings. Nearly 3,000 people responded to the force's appeal with Middle Earth-based jokes, gifs and photos. The ring in question is a replica of the "one to rule them all" from JRR Tolkien's novel, which was turned into a film trilogy by Peter Jackson. It was famously held for many years by Gollum who called it his "preciousss". In Tolkien's story it was taken to its final destruction by Frodo Baggins, which ensured the end to its creator - the evil Sauron. But it appears the ring was not cast into Mount Doom to be destroyed as last thought, and somehow found its way to Gloucestershire. Police set out to track down its owner by posting a photo online. Matthew Martin was first to respond to the appeal, saying: "If Sauron phones up looking to claim the ring, DO NOT give it to him." He added: "Gloucester's got enough problems without the Dark Lord wading in with his anti-social behaviour." This prompted a slew of animated gifs, including wizard Gandalf nodding in agreement. Steven Cherrett posted some of Gollum's classic quotes from the film, saying: "Curse them! WE hates them! it's ours it is, and we wants it! We wants it, we needs it." Kerry King-Neale went for a play on words, saying the ring had been "Tolkien without owner's consent". And Toby Maitland tried to explain to the force why telling people they had the ring was not good news. "There are literally three films and a massive book explaining why handing this in was a bad idea," he said. Others suggested that the books could have had a very different outcome had Facebook come to the Shires. Craig Batham asked: "Does this mean Frodo is now officially a high risk misper?" While Daniel Wright's comment must have taken the longest to think up: "You should be investigating first degree Mordor!" The ring's owner has still not been traced.